To create immersive computer games it is understandable that multimodal stimulation should play an important role in the development process. This isn’t to say developers will sit around having a meeting about how to address multimodal delivery in their latest game but it is something that teams are aware of whether they know it or not. For example, it is quite clear that if a river makes it into a game that it should have an associated sound, the flow of water, the splashes from fish and the croak of nearby frogs. This can also be enhanced with haptic feedback, such as entering the river and receiving force feedback via the control pad. So let’s now take a look at the theory behind multimodal stimulation in order to understand its importance. Research into sensory stimulus is normally grouped into different schools such as auditory, visual or somatosensory. However, as noted by King and Calvat  and Vroomen and de Gelder  real life consists of stimulus from more than one sensory input, which may influence each other. Single sensory inputs are rarely used on their own to gather a complete set of information. When walking through the countryside there is a distinct smell of fresh air, visual senses are stimulated by trees, the ground and mountains. Auditory senses are triggered by the wind, singing birds and the flow of a river. These sensory inputs combined together provide detailed information to the brain about the environment. Therefore when creating computer games it makes sense to consider how each element in a game can benefit from multimodal stimulation. Although multisensory stimulus should be treated as a whole there is a key difference between audio and vision. In vision, spatial location is an indispensable attribute but colour (frequency) is not, while frequency is an indispensable attribute of audio but spatial location is not . This theory is depicted in the figures below. The image on the left suggests that if two identical notes were played from one location a listener would only perceive one sound source, similarly, if there were two speakers in different locations both being fed with identical frequency content a listener would still perceive one sound. The listener will only perceive two sound sources if the frequency content differs, thus differentiating between two separate auditory stimuli is dependent upon frequency not spatial location. The image on the right shows the process for visual stimulus. Two light sources will always be perceived as one in the example shown, unless they differ in spatial location. Finally it is worth adding that with both vision and audition, time is an indispensable attribute. Therefore two identical auditory events heard at different points in time are distinguishable, as are two identical visual events. In context to auditory stimulus presented with visuals Rumsey and McCormick state that auditory spatial cues are “strongly influenced” by information from other sensory stimuli, “particularly vision”. Alais and Burr  conducted research and experimentation into the ventriloquism effect with similar results to Bertelson and Aschersleben, the results [8,9] of which presented not only the ventriloquism effect but also an inverse ventriloquism effect. 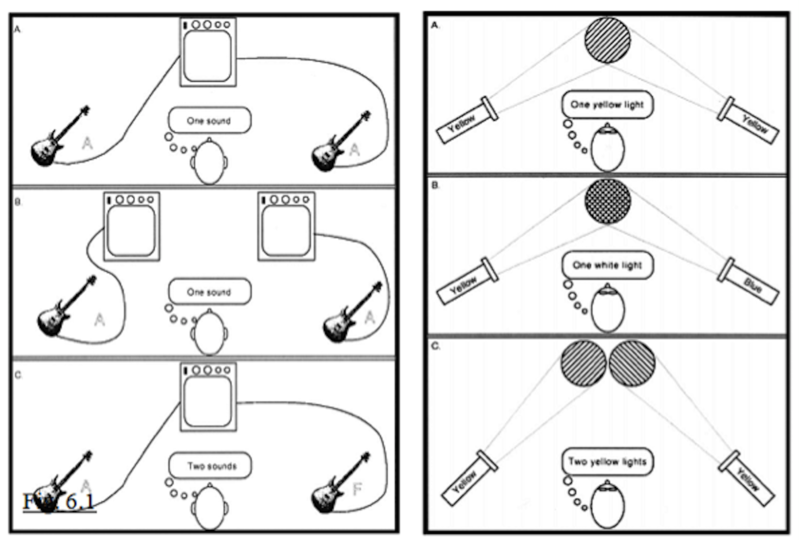 This experiment was conducted with different sized low contrast blobs, which were then projected onto a screen while “click” sounds provided auditory stimulus. Results indicated that small blobs led to the ventriloquism effect while larger blobs resulted in an inverse effect, causing audition to dominate. All of these findings reinforce the logic that audio and visuals go hand-in-hand when developing a game. Audio and visuals can even be perceived differently based on the impact of the other element. This now naturally brings us on to the question of quality. If visuals can affect audio and vice-verse, can the quality of one degrade or improve the perceptual quality of the other? Research has been conducted into how much a user will notice the degradation of sound quality while presented with visuals and secondly if audio quality can affect visual quality or vice-versa. Due to the nature of multimodal stimulation or indeed a game, there are several elements that a user must concentrate on; therefore, it is only natural that attention becomes divided. Experimental results obtained  suggest that a player is less likely to notice a lag between visual and auditory stimulus when immersed in a game, as opposed to simply watching a game. These results would suggest that high quality visuals are the most important aspect regarding audio-visual systems and that poor, or indeed out of time audio, is acceptable. However, research and experimentation has been conducted in order to realise the importance of the relationship between audio and visual stimuli. In the first of Storms’ experiments, his findings confirm the research of Laurel. Storms noted that when test subjects were asked to measure visual quality only, that “quality perception of a high-quality visual display is increased when coupled with a high-quality auditory display.” Simply put, high-quality visuals are perceived as being higher quality than they actually are when presented with high quality auditory stimulus. This perception of heightened quality does not apply in reverse. If high-quality visual displays are used with low quality audio and test subjects are asked to measure audio quality only, there will not be a perceived increase in audio quality. In fact the opposite can apply, making the audio seem further decreased than it actually is. Finally when test subjects were asked to measure the quality of both audio and visual stimulus, even when visuals were poor, high quality audio perception was increased. High-quality visual and auditory stimulus has been shown to improve the perceived quality of visuals. In part this may be due to mechanisms within the superior colliculus, as using both auditory and visual content will stimulate neurons within the midbrain, hence audition and visuals appear to create an output that is “greater than the sum of its parts”. However, as observed in Storms’ results this doesn’t allow low-quality audio to be perceived as higher quality if high-quality visuals are present. Storms noted that this could be due to games starting out with only visuals while sounds are added later. Hence sounds add to the overall experience making visuals appear enhanced. Attempts to investigate audio degradation with relation to visual stimuli by using visuals as a distracter from the audio quality have also been conducted. Their findings suggested that limiting the high and low frequency content over a 5.1 system resulted in a degradation of overall audio quality. The results also showed that the deterioration is mainly due to the front left and front right channels being limited, while (understandably) the centre and rear channel degradations are less noticeable. With a specific emphasis on audio quality in relation to computer games, a further two papers attempted to test how much a user will notice degradation when presented with not only visual stimulus (the graphics) but also having to concentrate on a computer game and complete certain tasks within the game. An experiment was conducted in which test subjects were to play a computer game while evaluating the audio quality. Unfortunately this paper concluded that more research was needed  but a second paper based on this research showed a “significant but very small overall effect”. The paper noted that a “visual task decreased the consistency of audio quality grading”. Interestingly it would appear that when a player is absorbed in a task, puzzle or particularly tricky part of the game they may not notice a degradation of audio quality. However, this would also suggest that less taxing areas of a game (for example empty corridors in Dead Space) will perhaps allow the player to concentrate more on audible feedback. In these areas a player is generally put on edge and audible feedback often includes eerie sounds, scrapes or the classic, a baby cry.